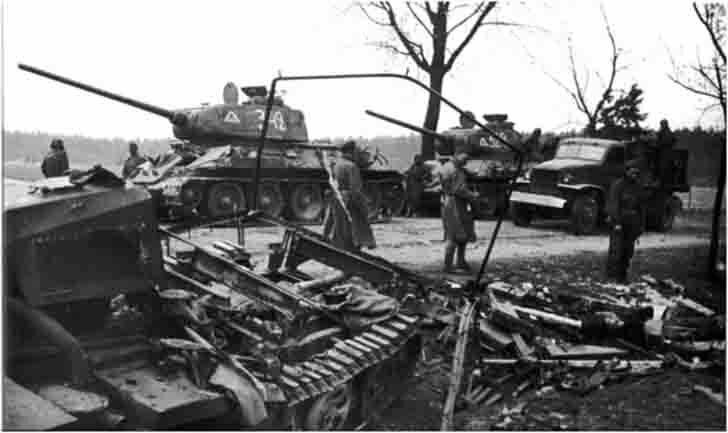 Two T-34-85 medium tanks of the 9th Armoured Corps are destroyed around the German Sd.Kfz. 11 tractor in Berlin. In the photo on the right – Truck Chevrolet G7107 of American manufacturing. T-34 – Soviet medium tank during the Great Patriotic War of the Soviet Union against Nazi Germany. T-34 medium tank was produced commercially from 1940. T-34 medium tank was the primary tank of the Red Army to the first half of 1944, before joining the army modifications of T-34-85. Since 1944, all the T-34 with a 76-mm gun received the designation T 34-76. T-34 – the most massive medium tank of World War II.